Alex Monteith Tamatea Dusky tripple excerpt 2014 from Alex Monteith on Vimeo. Current - Tamatea Dusky Sound: new artwork in production throughout 2014. 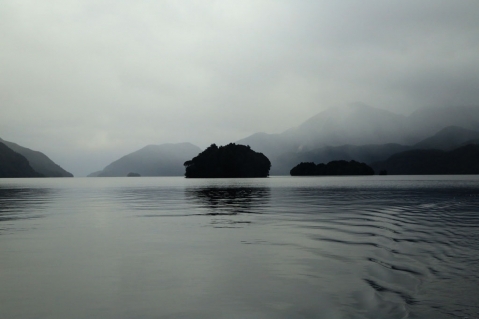 The project is orientated to a critical re-visitation of mid-late 20th Century archeology undertaken in Tamatea Dusky Sound in the lower fiords of Aotearoa NZ. The artwork traces the earliest modern archeology of the Tamatea region and reflects on implications of archeological collection processes practiced in the ‘field’ in Tamatea. The project is also concerned with ethical issues related to Māori intellectual property and taonga Māori in terms of their relationship to the museum holdings of material from modern digs throughout Tamatea Dusky Sound. Ongoing research collaboration of Dr Hūhana Smith (Ngāti Tukorehe, affiliated to Ngāti Raukawa ki te Tonga) in relationship to museum processes for Māori taonga. Creative New Zealand in the commissioning of Tamatea Dusky: Alex Monteith and Mark Adams 2012 Commissioner: Jane Button, (Melbourne, Australia).